One of the ways to add true sophistication to your outdoor landscape is to add lighting elements. Here are five tips on how to install lights for both aesthetic and safety purposes. 1. 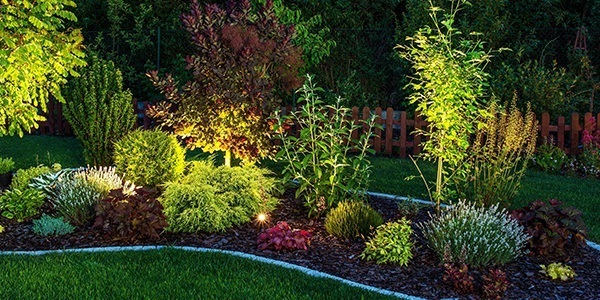 Add accenting lights to trees, shrubs, planting beds, or architectural features to make them focal points. 2. Make sure walkways are lighted by overhead or ground level accent lights. 3. Use globe lights to cast small pools of light on the ground to softly illuminate the edges of patios or other seating areas. 4. Add ambiance in your landscape with paper lanterns, outdoor torches, or string lights. These should be removable, or protected from high wind or hail by being placed under permanent structures. 5. Use floodlights with motion detectors around points of entry to your yard and home. As always, I appreciate referrals from my friends and past clients. If you know of anyone who is looking to buy or sell real estate, please send them my way!